Background: Anxiety is a human response to any unknown situation. Hospitalization and encountering an unfamiliar environment could lead to anxiety and its complications. Therefore, the aim of the present study was to evaluate the effect of individual and group tours on anxiety in children and their mothers. Materials and Methods: This quasi-experimental study was conducted on the three groups of individual tour, group tour, and control in two stages. The study was performed on 84 children. The self-report image anxiety scale and State-Trait Anxiety Inventory (STAI) (Spielberger et al.) were used for the assessment of anxiety among children and their mothers, respectively. Data were analyzed using Statistical Package for the Social Sciences software. Results: The results showed that the mean score of children's anxiety differed significantly between the three groups after the intervention (F = 40.58, p < 0.001). In addition, the three groups were significantly different in terms of the mothers' anxiety after the intervention (F = 4.12, p < 0.02). No significant difference was observed between the group tour and individual tour groups regarding the children's anxiety score (F = 0.02, p = 0.980) and mothers' state anxiety scores (F = 0.054, p = 0.950). Conclusions: The hospital visiting tours decreased the hospitalized children's anxiety and their mother's anxiety. This might be due to their greater familiarity with the ward's nurses, hospital environment, and facilities, familiarization with the unfamiliar new places and the location of different places, and speaking to and finding a sense of empathy and sympathy with their peers. Background: Several studies have addressed the environmental risk factors for multiple sclerosis (MS). Concerning contradictory results and change of epidemiologic patterns and the role of environmental factors, in the present study, some risk factors, especially environmental factors, on MS were studied. Materials and Methods: This was a retrospective case-control study conducted among 120 patients with MS and 360 healthy individuals in Kerman, Iran. Inclusion criteria included (1) MS disease, diagnosed by a neurologist according to the McDonald criteria, and (2) tendency to participation in the study. Exclusion criteria included (1) suffering from cognitive disorders; (2) incomplete questionnaire; and (3) continuous migration. Data were collected using a questionnaire consisting of personal information and some environmental factors. Data were analyzed using descriptive and inferential statistics. Results: The results showed that diet was associated with a higher risk of MS with the odds ratio (OR) of 14.46 and 95% confidence interval (CI) of 3.02–69.21 (p < 0.001) for vegetarian and OR of 11.74, 95% CI of 4.66–29.57 (p < 0.001) for animal diets. Similarly, vitamin D supplementation contributed to MS risk (OR: 2.27, 95% CI: 1.32–3.89; p < 0.001). In contrast, history of using cow's milk during infancy resulted in a lower risk of MS (OR: 0.33, 95% CI: 0.20–0.52, p < 0.001). Conclusions: This study suggests that different lifestyles including using cow's milk during infancy and avoiding only vegetarian and animal diets may reduce MS risk in southeastern Iran. More studies are suggested to investigate the controversial finding of the negative effect of vitamin D supplementation in this area. Background: Qualitative research methods can help investigators ascertain the depth of people's needs and their perceptions. This study was designed to describe mothers' experiences and perceptions of lay doula services during labor and delivery. Materials and Methods: This study was conducted using a qualitative approach and conventional procedures of content analysis. The participants consisted of 13 nulliparous women at three hospitals affiliated with Zahedan University of Medical Sciences in 2016. Data were collected using face-to-face semi-structured interviews. Purposive sampling continued until data saturation was ensured. All interviews were tape-recorded and transcribed in verbatim. Results: Participants' experiences were categorized into 11 subthemes and five major themes including (1) achieving self-esteem and empowerment, (2) more trust in God, (3) promoting mental health of the mother, (4) willingness toward normal childbirth, and (5) lay doula as a listener and perceiver. Conclusions: In our study, the mothers evaluated the presence of a lay companion as an effective helper during childbirth and someone who promoted a remarkable willing toward normal childbirth. Healthcare professionals must be cognizant of the needs, values, beliefs, preferences, and emotional well-being of disadvantaged women during labor and delivery in poverty-stricken areas of Iran. Also, this study highlighted that it is important to include the perspective of support persons (such as husbands) in research design of future studies. 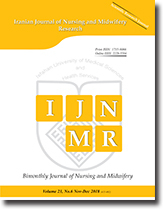 Background: This study aimed to determine the impact of the preceptorship program on self-efficacy and learning outcomes and the association between self-efficacy and learning outcomes in nursing students. Materials and Methods: This quasi-experimental study was conducted on 112 nursing students in 2012–2013. The subjects were selected through convenience sampling from the School of Nursing and Midwifery of Shiraz University of Medical Sciences, Iran. The general self-efficacy scale and the perception of overall learning outcomes scale were used to measure the students' perception of self-efficacy and achievement of learning outcomes. The data were analyzed using Pearson's correlation coefficient and linear regression analysis. Results: The students' mean [standard deviation (SD)] scores of self-efficacy and learning outcomes were 30.69 (5.88) and 4.10 (0.82), respectively, after taking part in the preceptorship program. The results showed a significant association between the mean scores of self-efficacy and learning outcomes (r = 0.30, p = 0.002). 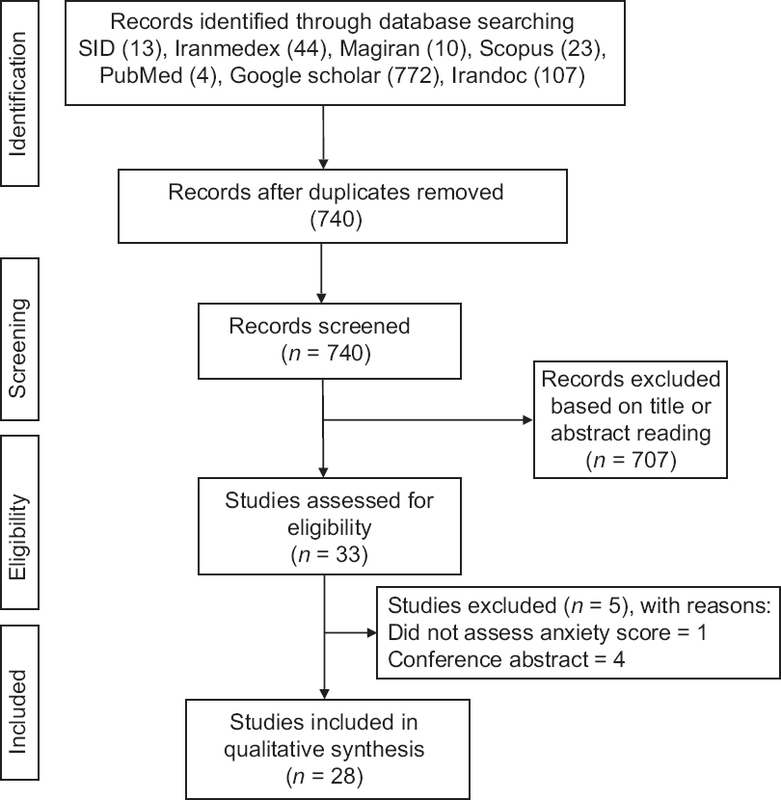 In addition, self-efficacy was predicted by gender (β = −0.19, p = 0.030) and the components of “understand ethical aspects of patient care” (β = 0.31, p = 0.010), “work more systematically” (β = −0.44, p = 0.005), and “use of nursing research” (β = 0.34, p = 0.020). Conclusions: Although the nursing students who participated in the preceptorship program demonstrated high mean scores of self-efficacy and learning outcomes, the lack of control group led to the conclusion about the effectiveness of the program to be made in caution. However, this program is suggested to be retained in nursing students' curriculum. Background: Occupational stress is both psychologically and physically challenging and may lead to high rates of absenteeism, burnout, and turnover. Nursing is considered as one of the most stressful and demanding professions. This study aims to measure perceived stress levels among nurses in a Greek public general hospital. Materials and Methods: A cross-sectional study was conducted. A total of 157 nurses and nursing assistants took part. A self-administered questionnaire including sociodemographics and Expanded Nursing Stress Scale (ENSS) for stress assessment was used. Analysis was performed using Statistical Package for the Social Sciences version 20.0. Results: Total stress mean(SD) score ranged in medium levels [136.27 (47.80)]. The most stressful situations were dealing with death and dying [18.29 (5.59)]; patients' and their families' demands [20.90 (7.12)], and uncertainty concerning treatment [22.19 (9.07)]. Discrimination [4.40 (4.25)] and conflicts with peers [12.07 (5.10)] provoked less stress. There was a statistically significant relationship between age and total stress (F = 4.23, p < 0.001) and all distinct stressors. Nurses between 30 and 34 years expressed higher stress in all cases except patients' and their families' demands stressor. Those nurses who were divorced expressed higher stress in death and dying subscale (F = 2.93, p = 0.035). Nursing assistants expressing higher stress as far as workload (t = −2.40, p = 0.017), conflicts with physicians (t = −2.19, p = 0.033), and problems with peers (t = −2.63, p = 0.009) were concerned, compared to nurses. Conclusions: The findings of the study are in line with other researchers' findings concerning stressors among nursing personnel in Greece. Appropriate measures for the prevention and management of specific stressors must therefore be taken. Background: There are standard guidelines for obesity management, although only few obese people can adhere to these guidelines. This study aimed to assess the effects of Extended Parallel Process Model (EPPM) on obese soldiers' knowledge, attitudes, and practices (KAPs) about obesity management. Materials and Methods: This randomized controlled clinical trial was conducted in Yazd, Iran (2016). Two military centers were chosen through simple random sampling. They were randomly assigned to the experimental or the control group. Then, individuals were randomly selected and either received or did not receive high-risk and efficacy information about obesity. The KAPs of soldiers were measured by researcher made questionnaires before, immediately after, and 1 month after training. Results: Independent t test showed significant differences in perceived severity susceptibility response efficacy self-efficacy knowledge and practices between two groups immediately after training (p < 0.001). Conclusions: It seems that obesity management training according to EPPM is effective to the improvement of soldiers' KAP during military services. Background: In spite of medical indications, preferences for the mode of delivery are influenced by several factors. However, as the literature suggests, the underlying motivation of women choosing vaginal delivery is rarely attended to. The current study aimed to explore first-time pregnant women's motivation for planning vaginal delivery. Materials and Methods: An exploratory design with in-depth interviews was employed from September 2015 to March 2016. Participants were asked key questions about their beliefs about vaginal delivery, perceived outcomes of vaginal delivery, the impact of others perspectives on their decision, and factors that might inhibit or facilitate vaginal delivery. A community advertisement was placed in obstetricians' offices, public health departments, as well as beauty salons throughout the city of Bandar Abbas, Iran, to enroll target participants. All interviews were tape-recorded, transcribed, and subsequently analyzed. Results: Twelve pregnant women within the age range of 19–33 years volunteered to participate. Ninety four initial codes were obtained. These codes were then summed up into three themes as well as six subthemes. The three themes specified were personal beliefs, deliberation and risk assessment, and personal autonomy. Conclusions: A number of key motivating factors such as fast recovery after vaginal delivery, immediate breastfeeding, and powerful bonding were identified, which were influential in choosing vaginal delivery. Awareness of the fact that the provided information shapes women's beliefs and can lead to attitude changes, midwives played a key role in shaping positive and healthy attitudes toward natural birth giving as well as empower them to make autonomous decision. Background: Healthcare workers, especially nurses, are at a high risk of infection. By complying with infection control measures, a lot of infections can be prevented. This study examined the effects of a training program on knowledge, perception, and risk reduction regarding infection control among nurses. Materials and Methods: This study adopted a pretest–posttest quasi-experimental design. The samples consisted of 87 participants comprising 42 nurses in the experimental group and 45 nurses in the control group. The instruments used for data collection were a questionnaire on knowledge about infection control and a questionnaire on perception about infection control. Results: Findings showed that the mean (SD) age in the experimental group was 34.92 (8.99) whereas that of the control group was 47.43 (6.60). The mean (SD) years of experience in the experimental group was 10.42 (9.95) years whereas in the control group it was 21.89 (8.72) years. Findings further revealed that 26 participants (62.90%) in the postintervention group had high knowledge level compared to the preintervention where none had high knowledge. A significant difference was observed between the mean perception score on infection control in the experimental and control groups (t = 17.12; p = 0.001). Conclusions: This study has shown that a training program is very effective and that all nurses should be exposed to infection control training to equip them with the necessary knowledge and skills with which to fight against the spread of infection in the healthcare setting. Background: The level of occupational violence against nurses increases from 68.8 to 98.6 percent, which is a considerable rate among healthcare settings. To create a safe environment for patient care in the emergency department (ED), a comprehensive program for the prevention of violence is necessary. The aim of this study was to plan a workplace violence prevention program (WVPP) to reduce the level of patients' and their families' violence against nurses. Materials and Methods: The present study is a quantitative part of a participatory action research project conducted in an 18-month period from October 2012 to May 2014 in an ED of Iran. In the diagnosing phase, we used quantitative and qualitative approaches. The second and third phases were assigned to design and implementation of WVPP involving a combination of educational and managerial interventions. In the evaluation phase, frequencies of patients' and their families' violence against nurses and nurses' fear of violence were measured. Results: Mc-Nemar test showed that 85.70% (n = 42) frequencies of verbal violence before implementing WVPP significantly decreased to 57.10% (n = 28) after implementing WVPP (p = 0.007). Statistical-dependent t-test (p < 0.001) indicated a significant difference in the mean (SD) scores of nurses' fear of violence before 46.10 (8.3) and after intervention 34.30 (4.6). Conclusions: Applying educational and managerial interventions was effective in reduction of workplace violence. Thus, it is recommended to include a combined approach in designing WVPP in cultures similar to Iran and pay attention to effective interactions with patients' family. Background: Ventilator-associated pneumonia (VAP) is one of the most common nosocomial infections that increase mortality rate and the length of hospitalization. Oral care can improve patient's oral health, however, the role of oral care in the reduction in incidence rate of VAP is indisputable. The aim of this study was to investigate the effect of oral care on the frequency of VAP of patients in intensive care unit. Materials and Methods: This clinical trial was conducted on 80 participants who were randomly assigned to a control group and an intervention group from 2016 to 2017. Data were collected at the first, third, and fifth days of the study using a demographic and clinical characteristics questionnaire and the Clinical Pulmonary Infection Score for detecting pneumonia. Data analysis was performed using descriptive and inferential statistics in SPSS software. 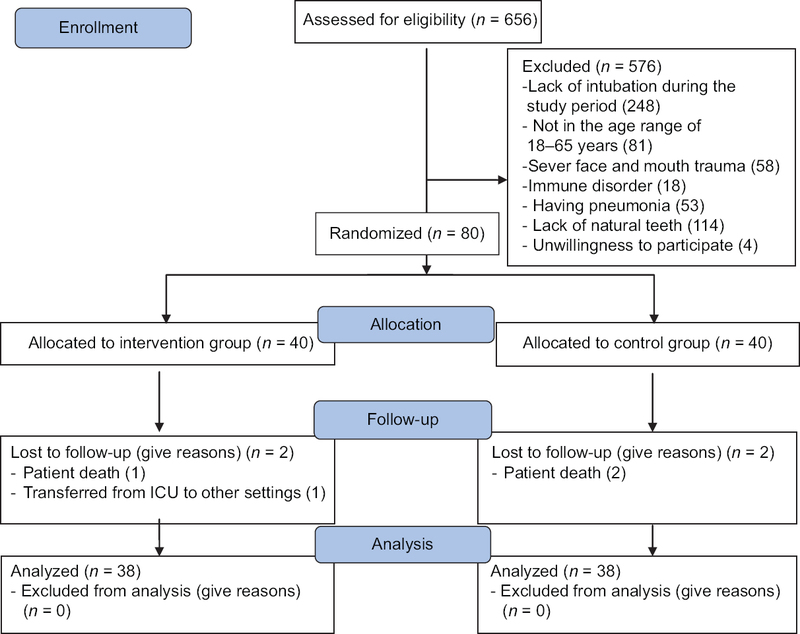 Results: The results of this study showed that the frequency of pneumonia on the third and fifth days was 15.80% (6) and 23.70% (9) in the control group and 10.50% (4) and 7.90% (3) in the intervention group, respectively. 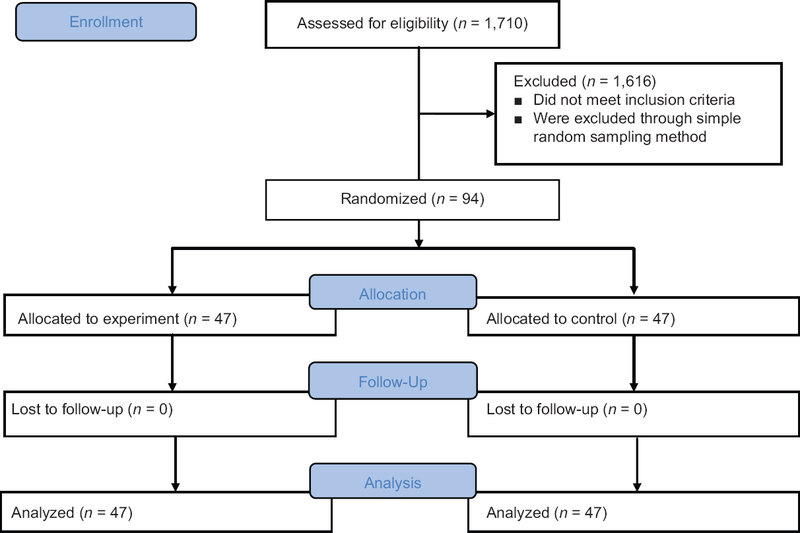 Chi-square test did not show a significant difference (p = 0.059); however, the frequency of pneumonia in the intervention group reduced compared with the control group. Conclusions: According to the results of this study, the oral care program could not significantly decrease the incidence of VAP in critically ill patients compared with routine oral care practices. Similar studies with a larger sample size and longer duration should be conducted for better results.